Arkansas soil types may present many challenges for Little Rock pool companies. In different parts of the state, soil conditions may be very rocky, and in other areas, red clay, shale, and even sandy loam may be the type of soil one may encounter in their yard. How a pool builder chooses to deal with this is sometimes unknown until excavation is underway or complete. If for instance, your yard has expansive clay, the pool builder may elect to address this with an increased grid measurement on the steel curtain, or possibly even move to a change of grade in the thickness of the steel. These changes, "engineer" the strength of the concrete (gunite) so that any probability of the pool shell developing a structual defect are mitigated. 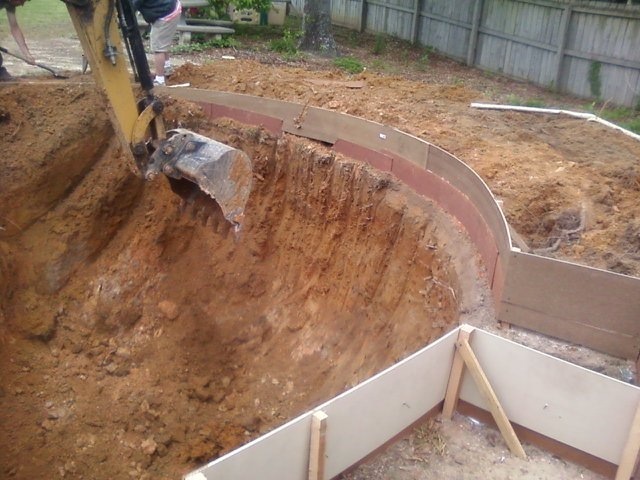 We have been a pool builder in Little Rock for over 17 years now and have built swimming pools all over the state. We have gained a great deal of experience dealing with these soil types. If you want to discuss this with us or set up a meeting to pre-determine your soil condition feel free to contact us. If we have any concerns we may suggest running a report on your land before swimming pool construction. It's important that you run these test prior to making a decision so you are aware of you soil type and know ether it will add aditional costs to your pool construction.